Based on the manga series by Masamune Shirow, director Mamoru Oshii's Ghost in the Shell (1995) stands tall as one of the most popular and influential animated imports of the last 20 years. Its impact ran deep in popular sci-fi and action films during the next decade...most notably The Matrix, as the Wachowski brothers were reportedly huge fans of Ghost in the Shell's striking blend of style and substance. 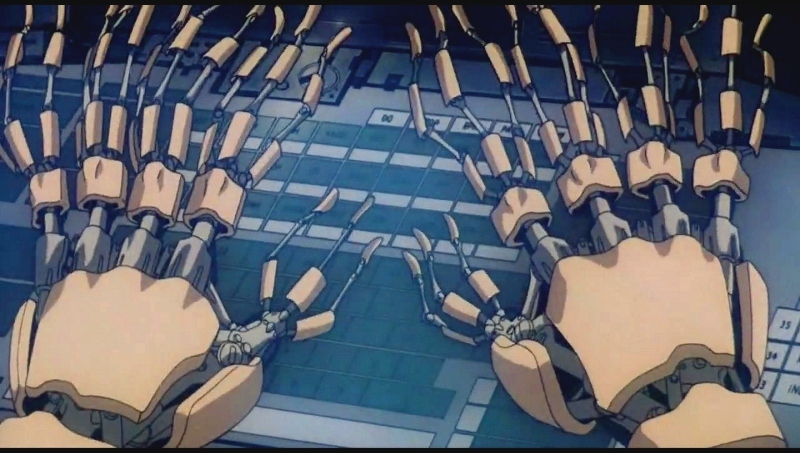 Pioneering the use of "digitally generated animation", Ghost in the Shell ranks among the very best in the genre regardless of era; needless to say, it's held up extremely well during the last 19 years and will most likely continue to engage and entertain fans of sci-fi for decades to come. 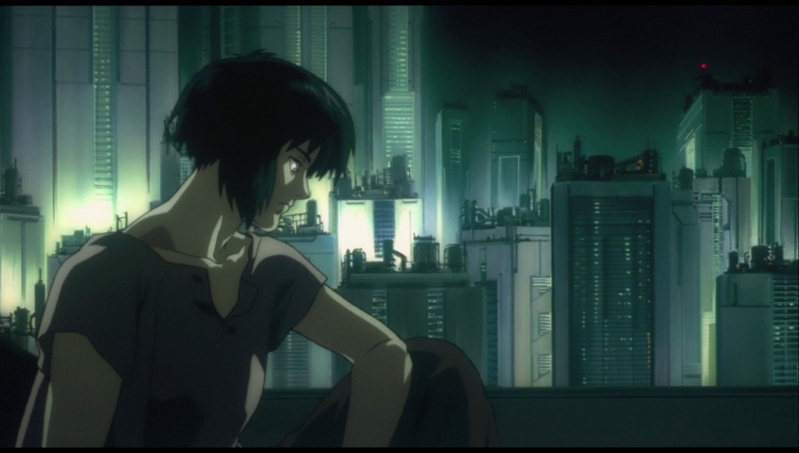 I'm probably not alone in admitting that films like Ghost in the Shell are what drew me to anime's domestic expansion during the mid-1990s, especially in the wake of earlier milestones like Akira, The Wings of Honneamise, Grave of the Fireflies, and My Neighbor Totoro, just to name a few. A high school friend of mine, originally from Japan, had access to plenty of stuff that you couldn't find at the local Best Buy or Suncoast, although I'm pretty sure that Ghost in the Shell was one of the first anime titles I bought on VHS at a "regular" store. Though I certainly enjoyed it at the time and considered it a gateway drug to more and more anime during the decade, I hadn't thought about Ghost in the Shell in years...at least to the point that I was unaware of the updated "2.0" version released six years ago. After a read-through of this summary that details the differences between both versions...yeah, I'm not interested in that at all. 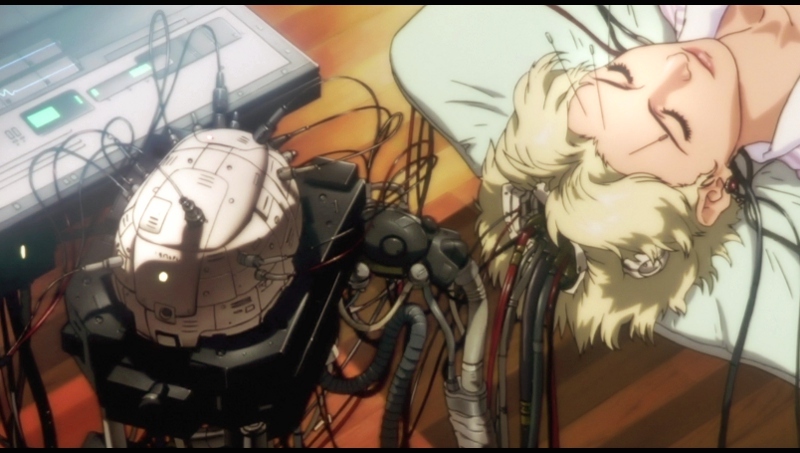 What does still interest me in Ghost in the Shell is what drew me to it in the first place: the eye-popping visuals and dynamite sci-fi tech. Our story revolves around Major Motoko Kusanagi (voiced by Atsuko Tanaka) and the world she's part of; one that grants people access to cybernetic bodies (or "shells") via a global electronic network. She and other members of Public Security Section 9 are on the hunt for "The Puppet Master", a skilled hacker with the ability to control shells without his victims' knowledge. Of course, his true identity remains a mystery for quite some time...and during their hunt, Kusanagi and her team discover a political conspiracy that reaches higher than initially expected. 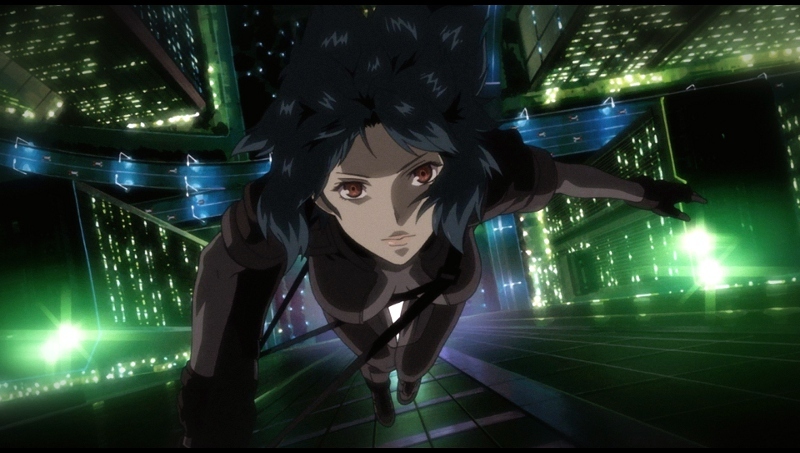 As the story unravels, some of the twists and turns may go completely over the head of first-time viewers and those relatively new to anime (including yours truly back in 1995)...but on subsequent viewings, Ghost in the Shell becomes more than just amazing action sequences, clever visual effects, and sweet technology based on the natural world. Ghost in the Shell has seen no shortage of domestic home video releases during the last two decades; most recently, a Special Edition DVD and the somewhat controversial "2.0" Blu-ray have seen the light of day. Those hoping for a proper 1080p release of the original version are undoubtedly excited for this "25th Anniversary" Blu-ray (which, for the record, celebrates the manga's birthday)...but, in almost every department, this one-disc package either falls short or misses the mark completely. Any way you slice it, this influential and popular film deserves better treatment. Presented in its original 1.85:1 aspect ratio, this 1080p transfer of Ghost in the Shell is passable...but there are a few problems here that some fans may not be able to look past. For starters, the image is window-boxed and, on properly calibrated displays, this means that thin black bars will surround the picture on all four sides; this is in addition, of course, to the standard thin bars present from the 1.85:1 framing. It's a minor but maddening issue, though somewhat more acceptable since this doesn't appear to be a brand new master. Otherwise, what we get here certainly isn't bad: the film's stylish colors and unique effects remain impressive and, for the most part, the jump to 1080p doesn't reveal a lot of seams. Black levels, image detail, and contrast are relatively strong on the whole, while digital imperfections are generally kept to a minimum. So perhaps my rating might seem a little harsh (because this is, in fact, a nice upgrade from 480p), but I've never been soft on "Anniversary Editions" that recycle more than they improve. DISCLAIMER: The compressed screen caps and promotional images featured in this review are resized do not represent Blu-ray's native 1080p resolution. With only one or two minor complaints, however, the audio offers a more well-rounded and pleasing experience. The best part is that both the original Japanese 2.0 track and the later English dub 5.1 remix are presented in lossless PCM and DTS-HD Master Audio, giving the ambitious sonic elements a nice little boost in quality. I'd imagine that some fans might be wondering why, on paper, the Japanese track gets "the short end of the stick", but let's remember that the original mix was 2.0 and it's great to see that preserved. Both are crisp and clear, though the English dub is obviously louder and more enveloping overall. Yet it's also a bit too harsh by design and, for my money, the stereo experience feels more naturally balanced and gets the job done. Either way, I'm happy we have a choice and you should be too. My only mild reservation lies with the subtitles, which seem to have been taken from a UK or Australian source, as evidenced by some of the slang ("yobbo", "rubbish") and spelling ("manoeuvre"). These can be more than a little confusing at times...and while at least they're not dubtitles, the degree of difference between them and the English audio renders them almost useless for anything except a very loose translation of the Japanese. Since I'm not familiar with the language at all, I only hope what we're getting here is a reasonably accurate rendering of the original script. I really appreciate this release's simple and clean interface, while the lack of excessive pre-menu logos, warnings, and other distractions is also very welcome. This one-disc release is housed in a silly eco-friendly keepcase; also included (and decidedly less eco-friendly) is a nice Booklet with a few short essays---including an interview with Mamoru Oshii---and a matching slipcover. Aside from that booklet, however, no extras are included. What a missed opportunity! Ghost in the Shell is an influential slice of Japanese animation that, in almost every regard, has aged quite well during the last 19 years. It's definitely overstuffed (even at less than 90 minutes), but the film's twisting plot and mind-bending technology---combined with ambitious visual effects---make this a sporadically satisfying feast for the eyes, ears, and brain, though the sensory experience largely overshadows most of its overcooked dialogue. Anchor Bay's "25th Anniversary" Blu-ray, unfortunately, falls a little short: the A/V is passable with mild reservations, but the lack of new and vintage extras is a total disappointment and almost a deal-breaker. Still, I'd imagine that die-hard fans of Ghost in the Shell will just be happy to have the original "non-2.0" version in 1080p...so if $20 sounds like a fair price for 83 minutes of game-changing animation, it probably is. Mildly Recommended.